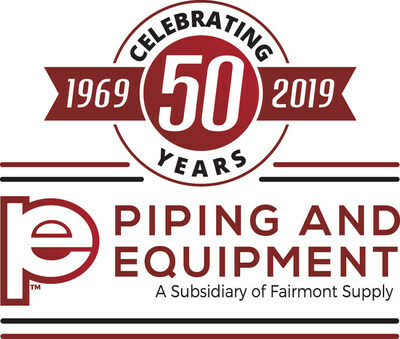 SMB Piping and Equipment, Inc. ("P&E"), a subsidiary of Fairmont Supply Company, is celebrating 50 years in business. Founded in 1969, P&E is a full line distributor of industrial pipe, valves and fittings. P&E is dedicated to accommodating the changing needs of its customers, while maintaining the same core values that past leaders established. Gary Cartright, Co-Founder and CEO of P&E, states, "I am thankful to have been part of P&E's five decades of success. Helping customers through continual product innovation, while keeping employees at the heart of its strategy, is P&E's true legacy." He continues, "This is an exceptional opportunity to recognize and thank all our customers, employees and suppliers for their support." P&E became a subsidiary of Fairmont Supply Company in July of 2007, which allowed the SMB to expand into new markets. Tom Pettit, Regional Director, says, "As we celebrate this milestone, we are proud of the achievements we've made, and look forward to the next 50 years of accomplishments. We have devoted ourselves to a half-century of product innovation and manufacturing efficiencies to provide our customers with the highest quality products and services. Throughout 2019, we will be taking a look at where we started, what we have achieved, and what our plans are for the future." To learn more about this SMB, visit pipingequipment.com. About Piping & Equipment Inc. Piping & Equipment celebrates 50 years of supplying the industrial market with pipe, valves, and fittings.